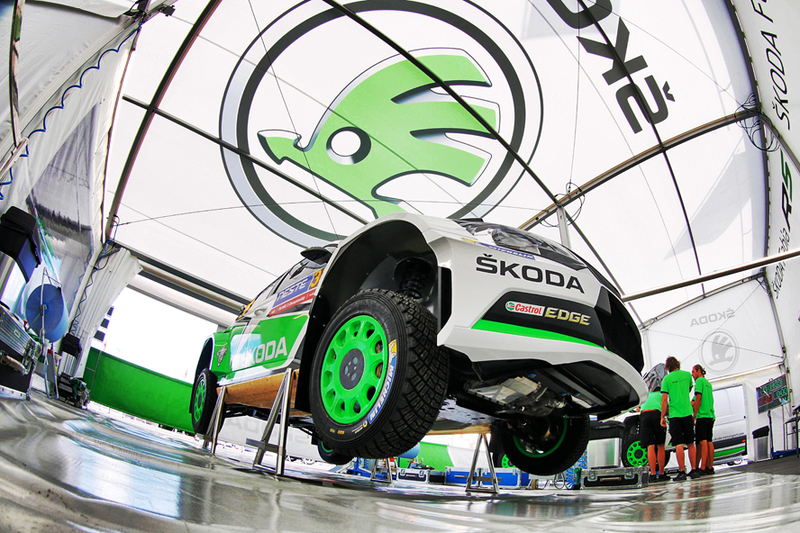 Rally Finland: ŠKODA is ready for “Formula 1 in the forest”. Mladá Boleslav, 26 July 2016 – ŠKODA starts the second part of the “high-speed summer” in the FIA World Rally Championship (WRC 2) with a tailwind. A good three weeks after Rally Poland, Rally Finland is the next ultra-fast gravel rally on the calendar as of Thursday. After five recent ŠKODA WRC 2 wins in a row, the Finnish ŠKODA works duo Esapekka Lappi/Janne Ferm in particular are looking forward to their home rally, which they won in the FABIA R5 last year. The Swedes Pontus Tidemand/Jonas Andersson, winners of the Rally Portugal in May, will also compete for ŠKODA Motorsport in a FABIA R5. Each of the last five WRC 2 rallies were won by a driver in the high-tech four-wheel drive FABIA R5. 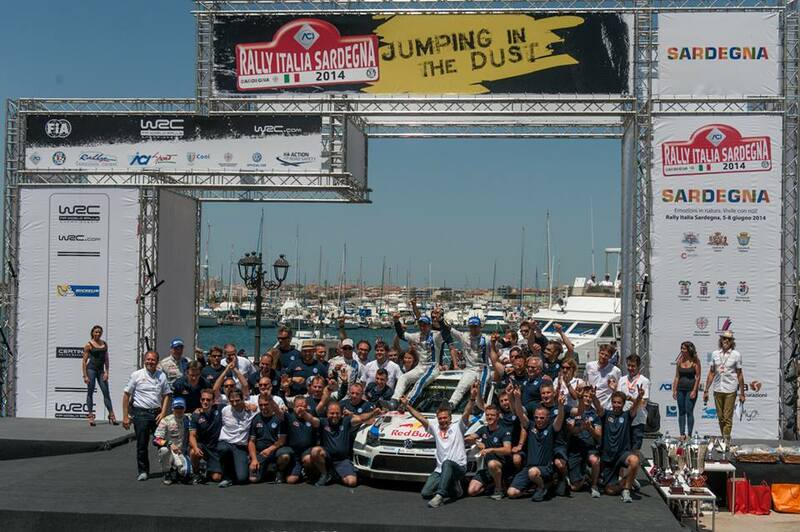 At the Rally Italy in June and the Rally Poland in July, the 23-year-old Finn Teemu Suninen was victorious, who also started the run of success at the Rally Mexico. At the Rally Argentina, Nicolás Fuchs (PE) in the speedy and reliable four-wheel drive from Mladá Boleslav was unbeatable. At the Rally Portugal, works driver Tidemand celebrated at the top of the winner’s podium. … the ŠKODA works drivers Esapekka Lappi and Pontus Tidemand clinched a one-two result in the FABIA R5 at the Rally Finland last year? Exactly one year ago, Lappi and co-driver Janne Ferm were victorious over ŠKODA Motorsport team-mates Tidemand and Emil Axelsson (S). … Esapekka Lappi will contest his home rally in Finland for the fifth time this year? 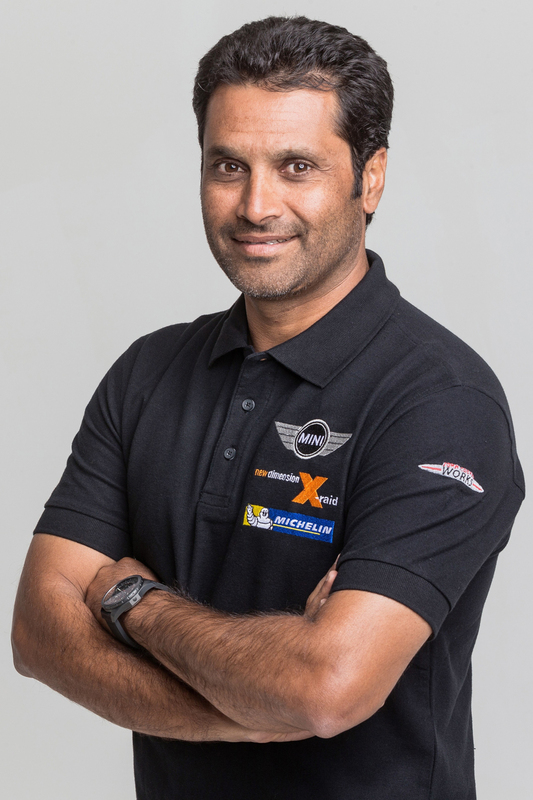 The Finn made his debut at the age of 20 in 2011, and finished in twelfth place in the R2 class classification alongside his co-driver Janne Ferm. … ŠKODA celebrated success with the FABIA SUPER 2000 at the Rally Finland? The Finnish duo Juho Hänninen/Mikko Markkula won the SWRC class at the rally around Jyväskylä in 2010 and 2011. Hänninen/Markkula even headed a one-two-three result for ŠKODA in 2010, with the Swedes Per-Gunnar Andersson/Anders Fredriksson and Patrick Sandell/Emil Axelsson in second and third place. Mikko Markkula is now the co-driver of ŠKODA driver Teemu Suninen (FIN). … the Rally Finland was held for the first time in 1951, to determine which Finnish drivers would compete at the Rally Monte Carlo? Since the World Rally Championship was introduced in 1973, the Rally Finland has been a permanent fixture on the WRC calendar – with one exception: The Rally Finland was part of the FIA 2-Litre World Rally Cup in 1995. … ŠKODA has six drivers in the top seven of the overall standings in the WRC 2? After seven of 14 rounds of the season, Teemu Suninen (75/four starts), Nicolás Fuchs (59/five starts), works driver Pontus Tidemand (49/three starts), Hubert Ptaszek (42/six starts), experienced German Armin Kremer (40/four starts) and works driver Esapekka Lappi (32/three starts) make it six drivers in the ŠKODA FABIA R5 lying in wait behind the leader, Britain’s Elfyn Evans (80 points from five starts to date). The third ŠKODA work’s driver Jan Kopecký (19/two starts) is tenth. Each driver can pick up points for the overall standings of the WRC 2 classification in seven selected rallies during the course of the year, with the six best results used for the classification. … ŠKODA Motorsport is also fighting for the title in the team standings of the WRC 2? Even though the team from Mladá Boleslav has only competed in four WRC rallies to date, they have already bagged 76 points. 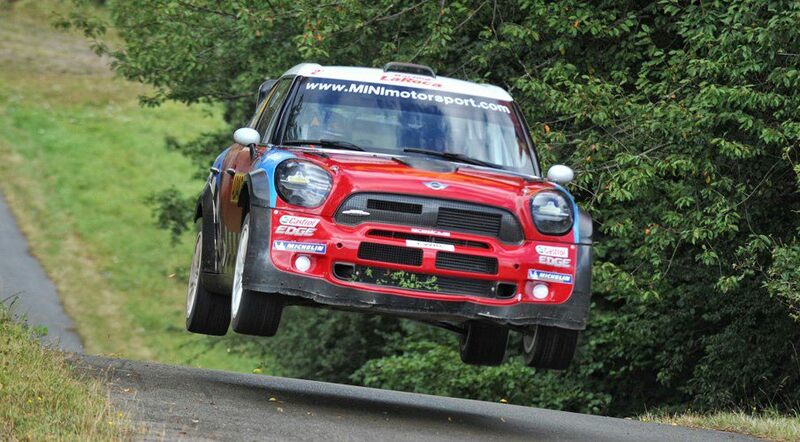 With 91 points from five rallies, M-Sport is currently still in first place. … the Rally Finland will be contested by a total of eight ŠKODA rally cars? In addition to the two works cars of Tidemand and Lappi, WRC 2 shooting star Teemu Suninen will once again compete in a ŠKODA FABIA R5 in the WRC 2 category. ŠKODA customers Hubert Ptaszek (PL) and Scott Pedder (AUS) have also registered. Local hero Joonas Soilu (FIN) will race in a ŠKODA FABIA SUPER 2000 at his home rally. The Finns Jukka Metsälä and Kari Hytönen will each compete in a FABIA R5, but without being registered for the WRC 2 class. … the Rally Finland is also jokingly referred to as the “Grand Prix of Finland”? 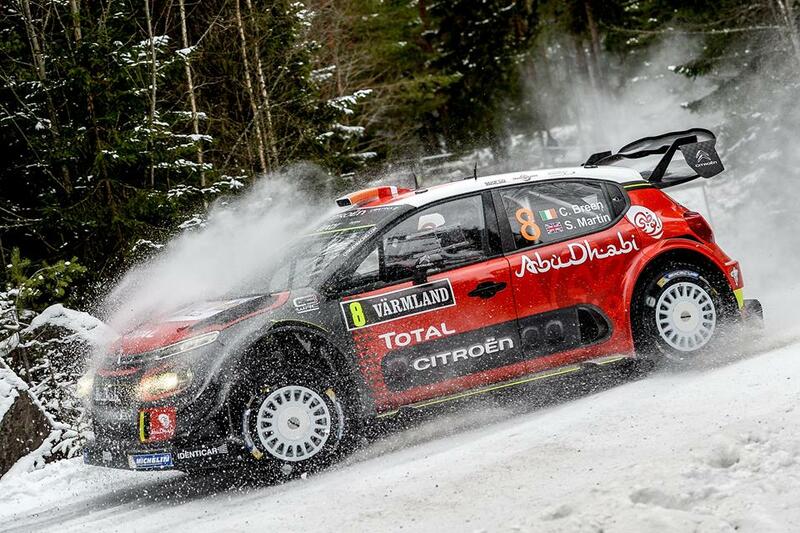 The rallying in the Finnish forests with its many, long, full-throttle passages is very similar to Formula 1. Along with the Rally Poland, the Rally Finland is regarded as the fastest on the WRC calendar; nine of the ten fastest WRC events of all time have taken place in Finland. … 43 percent of this year‘s rally route is new compared with last year? The special stage Lempäa was last on the route map in 1999. The special stage Oittila was last driven in 1994, but back then it was called Mutanen. … the rally centre of Jyväskylä with its 137,327 inhabitants is the seventh largest city in Finland? Jyväskylä was founded in 1837, has been a university city since 1966, and is also the capital of the region of Central Finland. Around a quarter of the inhabitants are students. … Jyväskylä is not only the home of famous rally drivers such as Tommi Mäkinnen (four-time World Rally Champion) and Henri Toivonen? Famous winter sports athletes such as ski jumpers Matti Nykänen (four-time Olympic champion), Jani Soininen (Olympic champion) and Risto Jussilainen (Junior world champion) also come from Jyväskylä. The NHL stars Sami Vatanen and Olli Määttä were also born in Jyväskylä. OGIER SUPERÓ A SORDO EN LA SEGUNDA ETAPA DE ASFALTO EN CATALUÑA Y VA POR SU CUARTO TÍTULO CON VOLKSWAGEN. ŠKODA HACE EL 1-2 EN LA WRC2 CON KOPECKÝ Y TIDEMAND. M-SPORT & VW, PRESENTARÁN SUS NUEVOS COCHES WRC 2017 A MEDIADOS DE DICIEMBRE. 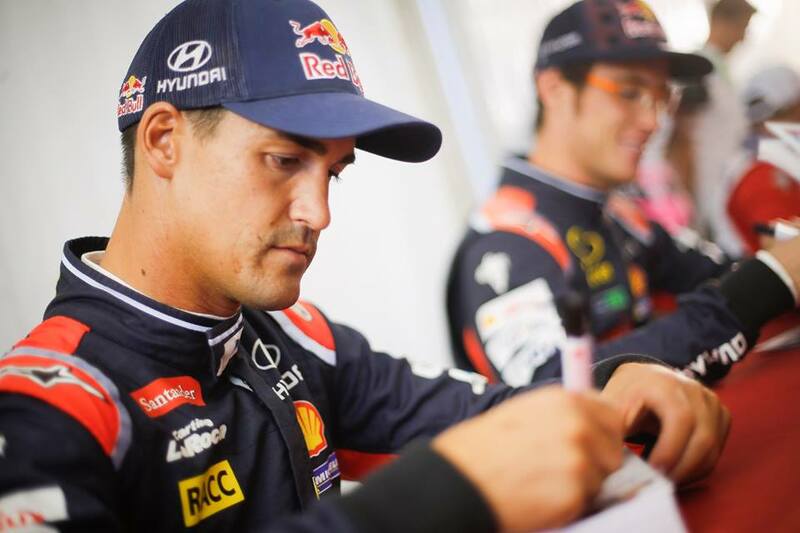 La ilusión del cántabro Dani Sordo, del día de hoy, era mantener la lígera diferencia que cosechó ayer en la etapa de ripio mojado con algunos sectores con barro tripulando su efectivo Hyundai i20 WRC New Generation. Pero hoy nada fue sencillo para el español, en primera instancia con problemas de subviraje en su unidad coreana armada en la factoría alemana de Alzenau, que le hicieron perder al término de la jornada valiosos segundos. Sin embargo, hay que decir, que el galo Sébastien Ogier realizó una remontada de aquellas, estableciendo cronos al más no poder, con un ataque frénetico sobre el piloto local de Hyundai, demostrando porque es el conductor de la especialidad del momento con casi cuatro coronas consecutivas en su haber, pilotando de forma perfecta el Polo R WRC junto a su amigo e inseparable navegante Julien Ingrassia. Descontando los 17 segundos que había de distancia entre ambos al finalizar el día inicial de tierra y ahora aventajando por 5.8 segundos contra la motivación intacta que origina Sordo, en el Rally de su casa, frente a su público y ante la gran oportunidad de cortar la racha negativa de no poder ganar en Cataluña. En tercer escalón y en discordia se ubicó el belga Thierry Neuville, con el otro i20 WRC oficial de última evolución, con tiempos aceptables, pero lejos de Ogier y Sordo, y favoreciéndose, tras al abandono sorpresivo por vuelco del noruego Andreas Mikkelsen en la prueba especial 12, cuándo ocupaba la tercera plaza y tenía opciones de podio. Sin poder implementar su gran actuación del 2015, el rubio de Noruega, se va con las manos vacías de Salou. En tanto que el fines Jari-Matti Latvala ha tenido un Rally para el olvido con el Polo R WRC número 2, con muchos inconvenientes, tanto en errores de conducción, con trompos, etc y pérdida de tiempo relevante en los varios pinchazos que lo consumió, quedando entre los 20 mejores clasificados al culminar este día sábado en PortAventura. El “Kiwi” Hayden Paddon se recompuso de la mala puesta a punto del viernes y sostuvo un plan de trabajo constante a bordo de su i20 WRC, optando por la interesante cuarta posición, teniendo al británico Kris Meeke de la DS3 WRC by Abu Dhabi y al noruego Mads Ostberg de M-Sport entre el quinto y sexto puesto respectivamente, a sus espaldas, del talento de Nueva Zelanda, que se anima a decir, que sueña con el podio en suelo catalán. Mientras que en la WRC2, las cosas están muy claras, solo una escuadra que domina a voluntad, los checos de ŠKODA, con sus dos estrellas que manejaron formidablemente sus Fabia R5, el experimentado Jan Kopecký y el sueco Pontus Tidemand. Que desde mañana buscarán el 1-2 fantástico para la marca que gestiona Michal Hräbanek y Pavel Hortek, desde su cuartel general ligado a Praga en Mladá Bolesvav. Para finalizar dos cosas, los constructores M-Sport de Ford y Volkswagen Motorsport han confirmado que mostrarán próximamente a la prensa especializada a mediados del mes de diciembre sus nuevos autos de cara al revolucionario WRC 2017. Los esperados nuevos Fiesta RS WRC y VW Polo R WRC con las innovaciones aligeradas de las especificaciones que propone la FIA bajo la regulación WRCar 017 desde Montecarlo, la apertura central del Mundial en el año próximo. 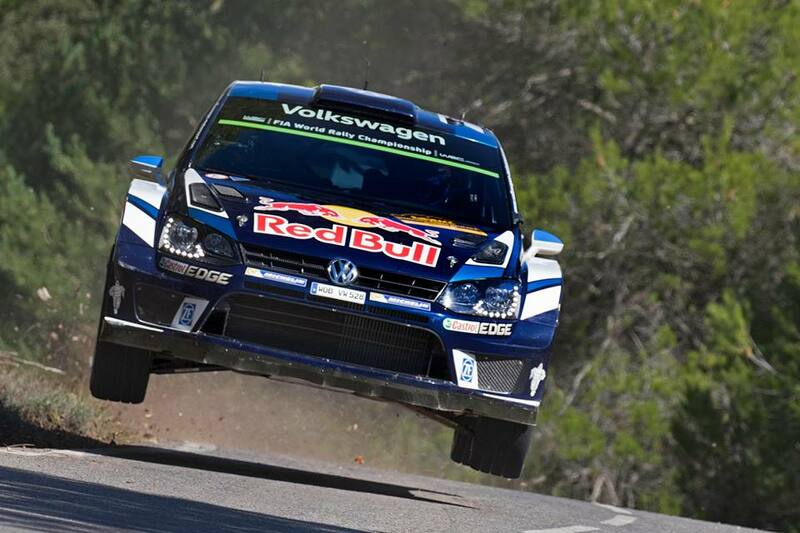 1-Ogier-Ingrassia-VW Polo R WRC – 2h.35m.12s.8/10 99.813 km/h. 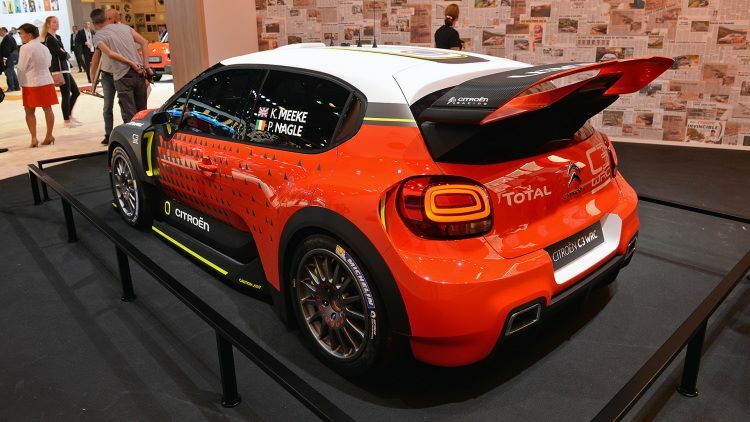 3-Neuvile-Gilsoul-Hyundai i20 WRC New Generation -a 1m.03s9/10. 4-Paddon-Kennard-Hyundai i20 WRC New Generation -a 1m.20s. 1-Kopecky-Dresler-ŠKODA Fabia 2h.42m.54s.4/10 95.138 km/h. DANI SORDO CON POCAS CHANCES DE PODIO EN EL TOUR DE CORSE. Dani Sordo pierde opciones de podio en Córcega. Cuando ocupaba la tercera posición provisional del Rally Tour de Corse, Dani Sordo se ha visto retrasado debido a un pinchazo en la última especial disputada hoy. 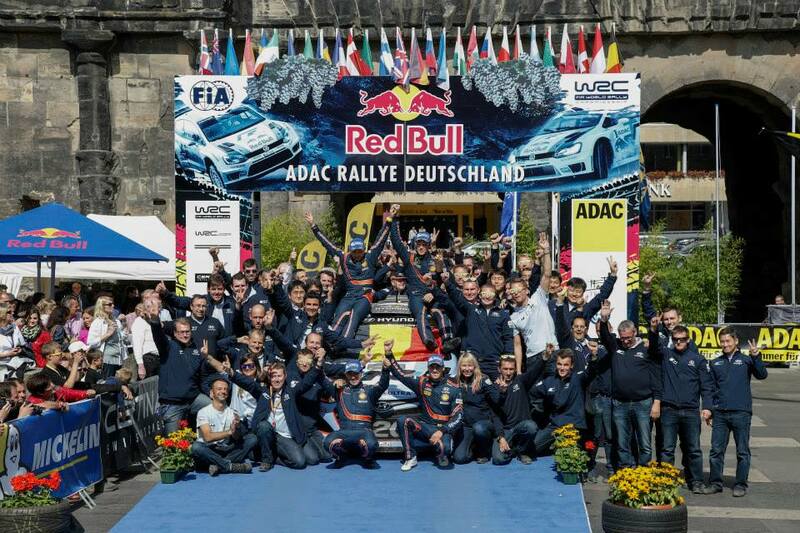 Sordo se ha visto apeado de la lucha por el podio por el que peleaba igual que en el pasado Rally de Alemania, y afrontará la segunda etapa de la prueba corsa en novena posición con el objetivo de llegar con el mayor número de puntos posibles el domingo a Porte-Vecchio, donde finalizará la presente edición del Rally Tour de Corse, décima prueba puntuable para el Campeonato del Mundo de Rallyes. 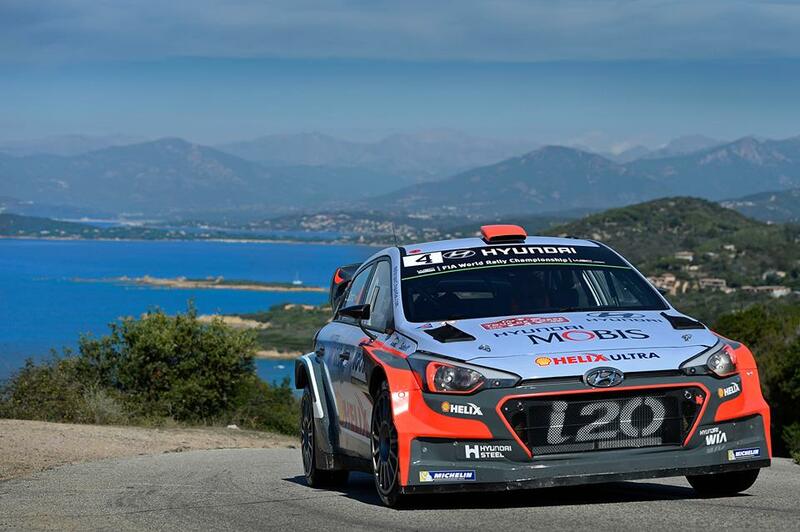 Dani empezaba la jornada acusando algo de subviraje en su Hyundai i20 WRC, a pesar de lo que marcaba el tercer mejor tiempo en la primera especial del día, Acqua Doria-Albitreccia, de 49,72 kilómetros. El piloto español del Hyundai Shell World Rally Team se iba encontrando más a gusto a medida que transcurría la etapa, pero pinchaba una de las ruedas traseras a pocos kilómetros del comienzo del último tramo cronometrado disputado hoy, perdiendo aproximadamente dos minutos: “Después de los tramos de la mañana me encontraba más a gusto con el coche, y he conservado los neumáticos en el primer tramo de la tarde de cara al último, pero he notado que el coche se movía de la parte trasera hasta que hemos comprobado que se trataba de un pinchazo y hemos tenido que parar a cambiar la rueda en pleno tramo. Ha sido decepcionante. No sé cómo ha ocurrido. Una pena, ya que nos encontrábamos en una buena tercera plaza. Intentaremos ganar alguna posición de aquí al domingo”, explicaba Sordo tras finalizar el último tramo disputado hoy. Con salida y llegada desde Bastia, al norte de la isla, la jornada de mañana sábado será la más larga del Rally Tour de Corse y estará compuesta de dos bucles a los tramos La Porta-Valle di Rostino (53,72 kilómetros) y Novella-Pietralba (30,80 kilómetros). 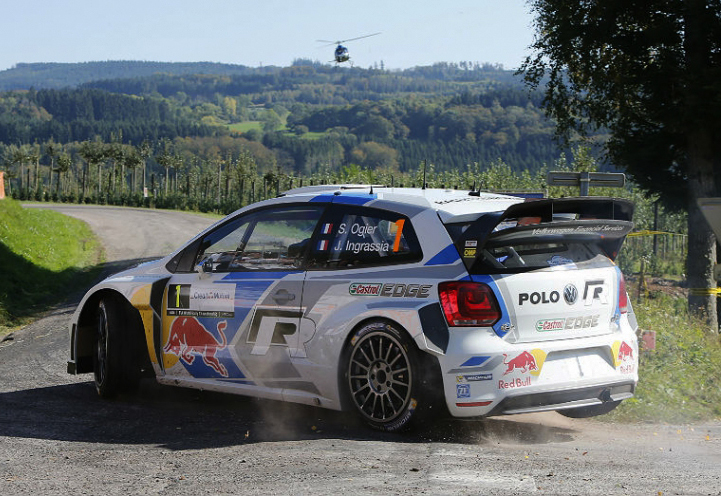 Ogier in a league of his own on day one of the Rally France. Wolfsburg (30 September 2016). It doesn’t get any better than this. 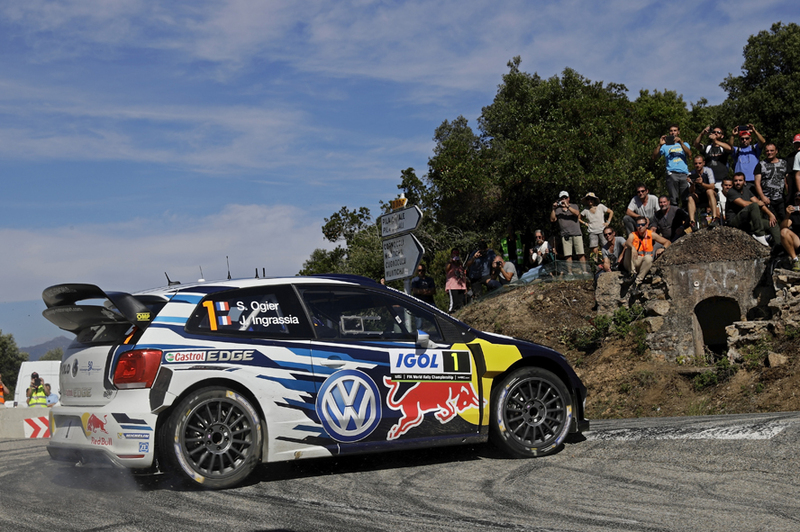 Sébastien Ogier/Julien Ingrassia (F/F) made a perfect start to the Rally France on Corsica in their Polo R WRC. 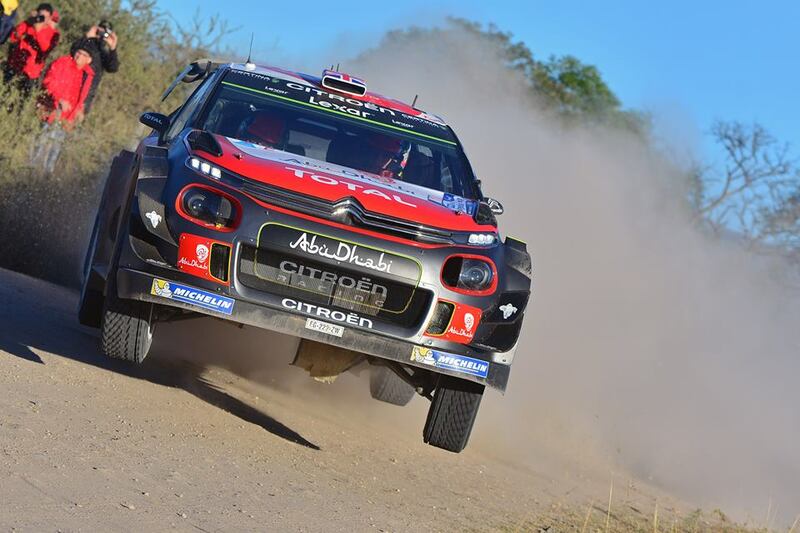 The three-time world champions, who could claim the title for the fourth time in a row with victory at their home race – provided other results go their way – won all four special stages on the opening day of round ten of this season’s FIA World Rally Championship (WRC). Two of the duos out to prevent the Frenchmen from getting their hands on the title this weekend are their Volkswagen team-mates, who are also on course for success: Jari-Matti Latvala/Mikka Anttila (FIN/FIN) ended day one in third place, just ahead of Andreas Mikkelsen/Anders Jæger (N/N) in fourth. Second place after 157.68 of 390.92 kilometres against the clock is occupied by Thierry Neuville/Nicolas Gilsoul (B/B, Hyundai). While Ogier/Ingrassia opened a commanding lead of 44 seconds, just 15 seconds separate the chasing pack of three in their battle for second and third. The opening day featured some typical Corsican special stages: narrow, winding roads and long sections put driver, co-driver and car through their paces in gorgeous autumn weather. … a little milestone. 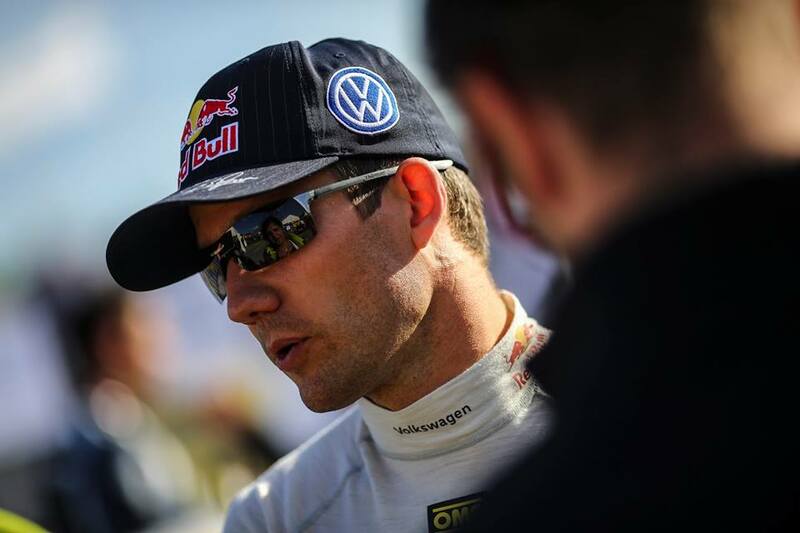 Andreas Mikkelsen is contesting his 75th rally in the World Rally Championship at the Rally France – the 45th with Volkswagen and the tenth with his co-driver Anders Jæger. The Norwegian made his debut at the 2006 Rally Great Britain. Since then, he has finished on the podium on 18 occasions, including victories at the 2015 Rally Spain and the 2016 Rally Poland – all with the Polo R WRC.